Field Day, where Hams all around the country spend a weekend "in the field" operating under emergency conditions is coming. Next weekend I'm travelling to Nebraska to mount an operation with my cousin Brad, KG0GY, from Juniata, Nebraska. Brad and I have similar operating interests, and we've been talking about doing this for years, so it should be fun. He's been active with the Lincoln Amateur Radio Club for years, and I've been active with the Wheaton Community Radio Amateurs. We've both been active in Field Day with those clubs, and have both been very active in those clubs. We also share the view that we're tired of clubs, but like Field Day, so this is our solution. We'll be operating 80, 40, 20, and 15 meters, primarily on CW, but may run a little SSB, if we're bored. We'll be running my Elecraft K2/100 and his Icom 746Pro. I've got a small Honda EU2000 generator that will provide our power. The wife was cleaning out some old trunks and found this picture from january 1966 of my Novice station. Yes, I was 12 years old, WN0NHG, and the proud owner of a Heathkit HR-10B receiver, a Globe HG-303 transmitter, and a Knight Kit SWR bridge. 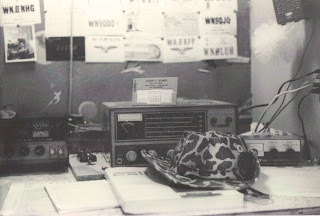 Note the QSL cards on the wall, most of them with other Novice calls. For those of you who don't know what I'm talking about, in the past there was a Novice class of license, which was how most people got into Ham radio. It required passing a 5 word per minute code test and a simple test, mostly covering regulations. It was good for one year, and you were limited to three 50 KHz bands on 80, 40, and 15 meters. Transmitters had to be crystal controlled and limited to 75 watts.